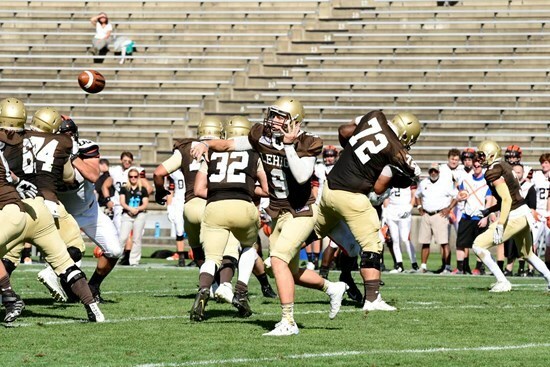 Once upon a time, Lehigh’s offense had the nickname “Air Lehigh”, and players like QB Scott Semphiphelter, QB Phil Stambaugh and many other Mountain Hawk quarterbacks hucked the ball around Murray Goodman Stadium like kids in a sandlot, and posted some serious passing numbers that made the place a very fun spot to watch college football on Saturdays. Today at Murray Goodman, senior QB Nick Shafnisky brought us back to those Air Lehigh days with a game with the same type of offensive firepower. Pairing up with junior WR Troy Pelletier and junior WR Gatlin Casey for more than 100 yards receiving apiece, the Whitehall, PA native brought Lehigh fans back to the future with a 461 yard passing performance, coming oh-so-close to setting a Lehigh record in the process. 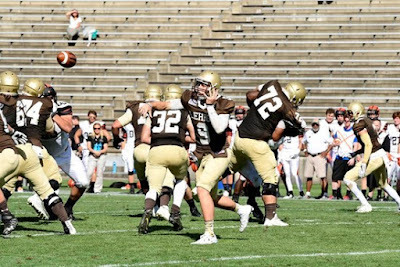 In the end, Lehigh fans left Murray Goodman stadium with a lot of pleasant memories about a beautiful, unseasonably warm Saturday afternoon and a resounding 42-28 win over a Princeton team that hung 50 points on them last season. Not that winning football games at Murray Goodman stadium the past few seasons wasn’t fun, mind you – but few wins evoked the sandlot quality that this game did.